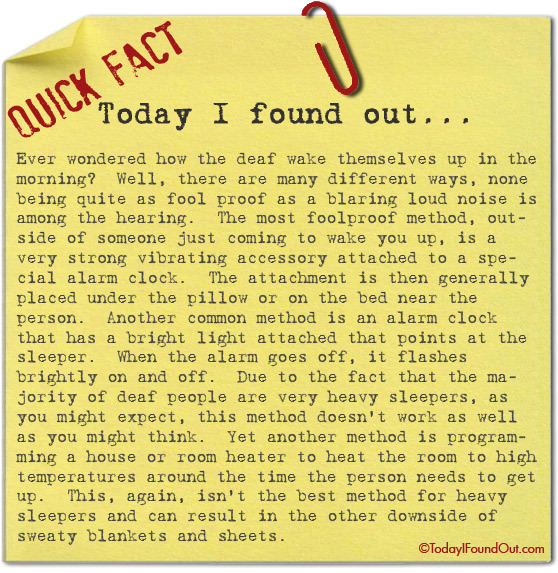 Ever wondered how the deaf wake themselves up in the morning? Well, there are many different ways, none being quite as fool proof as a blaring loud noise is among the hearing. The most foolproof method, outside of someone just coming to wake you up, is a very strong vibrating accessory attached to a special alarm clock. The attachment is then generally placed under the pillow or on the bed near the person. Another common method is an alarm clock that has a bright light attached that points at the sleeper. When the alarm goes off, it flashes brightly on and off. Due to the fact that the majority of deaf people are very heavy sleepers, as you might expect, this method doesn’t work as well as you might think. Yet another method is programming a house or room heater to heat the room to high temperatures around the time the person needs to get up. This, again, isn’t the best method for heavy sleepers and can result in the other downside of sweaty blankets and sheets. “The majority of deaf people are very heavy sleepers” – what the hell does that mean? This whole article makes deaf people sound incompetent. @John: “‘The majority of deaf people are very heavy sleepers’ – what the hell does that mean?” … It means they’re often heavy sleepers. “This whole article makes deaf people sound incompetent.” How does being a heavy sleeper or needing some wake-up device that doesn’t rely on sound make someone seem incompetent? I guess I don’t see the connection. It means that because they can’t hear they have pretty uninterupted sleep and are therefore in dep sleep for longer periods than average people. Think before you post next time! Sleep stages run in cycles, and these are not mediated by environmental sounds. If saying they are very heavy sleepers means that they don’t wake easily in the morning, that would make sense. But there is no reason to believe they spend longer in the ‘deeper’ stages of sleep. a) they use a flashing light, which “doesn’t work as well as you might think.” So why then do they use it? None of the deaf people I know have trouble waking up on time. Why describe methods that don’t really work? Hi, I am deaf myself, and I have to be honest, I have never, ever in my life heard about the heating method. Also, with the lighting method, it does work very well because we have increased senses since we only have four, therefore, we are very sensitive to light. The vibration method works the best because sometimes we sleep with the back of our heads to the light. Sometimes deaf people even combine the two, vibration and lighting. Just so you all are clear. Some deaf people are not heavy sleepers since they have sensitive eyes. They’d wake up when something bright hits their eyes. Heating method is interesting, but I don’t think it’ll work efficiently like other two. I’m not deaf but – I use the Moon Beam alarm clock that has a light go off for a few before the sound starts. I loathe waking up to that annoying alarm sound. Or I’ll put my cell alarm on vibrate. …I really, really dislike the beeping of alarms. If I don’t have to wake up at a certain time, I’ll open the blinds before I go to bed so I can wake up when the sun rises. Don’t know about turning on the heat though – who wants to wake up all hot and sweaty? Actually, I seem to always sleep in longer when it’s hot. Blech. I use the Moon Beam alarm clock that has a light go off for a few before the sound starts. I loathe waking up to that annoying alarm sound. Or I’ll put my cell alarm on vibrate. …I really, really dislike the beeping of alarms. If I don’t have to wake up at a certain time, I’ll open the blinds before I go to bed so I can wake up when the sun rises. I don’t find that funny at all. I’m as well deaf, and i don’t think you would want to wake up by a dog shock collar? Really, that was kind of mean… I use the light method, it works very well. I dated a deaf guy for a year, i miss the vibrating bed alarm! Way more soothing than that horrible beep noise. The light didnt work for him, but i have some deaf friends that use it. Some of them just use their cell phone alarm on vibrate. I have never, ever heard of the heated room thing. That sounds impractical. I actually have one of those vibrating alarm clocks, even though I’m not deaf. They actually do work very well. What always works for me (because although I am not deaf I am an incredibly heavy sleeper) is when my bf gets up in the morning the dog and cat sneak in the room and start playing on the bed. I’m sure there has to be at least one deaf person who has rigged an “alarm” that open their door in the morning so their pets can get them out of bed. I’m dead and have been most of my lights. My parents say even if I weren’t deaf, I’d still be a heavy sleeper which I am. We’ve tried over 50 alarm clocks and none of them work. My parents say I have to figure out how to wake myself up because I’m an up coming junior. I don’t know what to do!! My eyes couldn’t care less if im sleeping in light or not as well as heat. Any advice? Well, my suggestion would be that you come back from the afterlife, as being dead can often result in trouble waking up. Hell, I have friends and relatives that haven’t woken up in years because they have the same problem as you. Let me know if you find the solution though as we haven’t really figured out a cure for your… complication yet.